Burnished Copper Tone, Brown Leatherette Fish Hook Leaf Dangle Earring Set. 1/2" X 2 3/4". Antique Matte Gold Tone, Fish Hook Sports Baseball Dangle Earring Set. 3/4" X 1". Antique Silver Tone, Multi Color Abalone Shell Print Acrylic, Fish Hook Dangle Earring Set. 3/8" X 1 1/2". Patina & Burnished Copper Tone Fish Hook Dangle Earring Set. 3/8" X 2 1/2". Antique Silver Tone, Metal, Filigree Elephant Dangle Fish Hook Earring Set. Drop length 1 1/4". Burnished Silver Tone, Metal, Fish Hook, Horse Dangle, Western Theme Earring Set. 1" x 2 1/8". Silver Tone Abalone Shell Print Fish Hook Dangle Dragonfly Earring Set. Drop length 1 3/4". Burnished Silver Tone Fish Hook Feather Dangle Earring Set. Drop length 3 1/4". Antique Silver Tone, Turquoise Stone Fish Hook Tear Drop Dangle Filigree Earring Set. Drop length 1 3/4". Gold Tone, Thin Metal, Fish Hook, Chandelier Earring Set. 1 1/2" X 3". 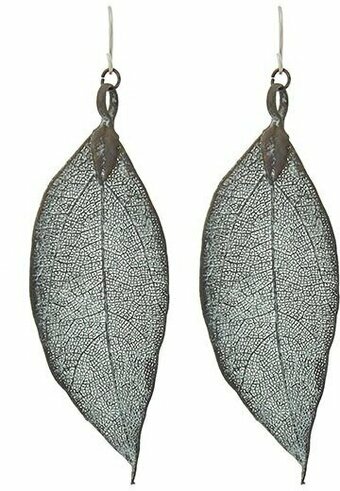 Patina Metal Fish Hook Leaf Dangle Earring Set. 1" X 3 1/8". Patina Fish Hook Sea Life Sand Dollar Dangle Earring Set. 1" X 1 1/2". Antique Silver Tone, Clear Rhinestone, Fish Hook Anchor Dangle Sea Life Earring Set. Drop length 1 3/8". Antique Silver Tone, Fish Hook Sea Life Turtle With Starfish Dangle Earring Set. 5/8" X 1 1/2". Burnished Copper Tone, Multi Patina Metal, Fish Hook, Dangle Leaf Earring Set. 1" X 3 1/2". Burnished Silver Tone, Turquoise Stone, Fish Hook Dangle Leaf Earring Set. Drop length 3 1/4". 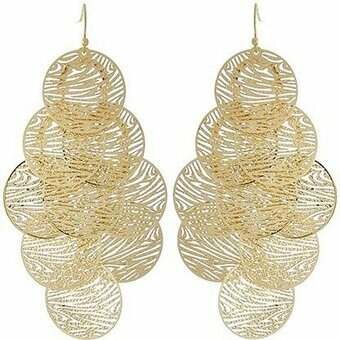 Matte Gold Tone Fish Hook Oval Dangle Earring Set. 1" X 2". Matte Silver Tone Fish Hook Oval Dangle Earring Set. 1" X 2". Burnished Silver Tone & Patina Fish Hook Teardrop With Flower Dangle Earring Set. 7/8" X 1 1/4". Turquoise Stone Brown Suede Fish Hook Feather & Tassel Chandelier Earring Set. 1" X 3 1/2". Copper Tone and Patina Fish Hook Dangle Earring Set. 2" X 4 1/4". Drop approximately 1". Fish hook ear wire. Burnished Silver & Burnished Gold Tone Fish Hook Dangle Earring Set. 1/2" X 3". Antique Silver Tone, Blue Glitter Epoxy, Fish Hook Dangle Earring Set. 7/8" X 1 1/4". Antique Silver Tone, Multi Color Epoxy, Metal, Fish Hook, Dragonfly Dangle Earring Set. 7/8" X 1 1/8". Antique Silver Tone, Metal, Fish Hook, Western Theme, Horse Dangle Earring Set. 1 1/8" X 1 1/8". Burnished Silver Tone, Clear Rhinestone, Filigree, Cowboy Boots Dangle, Western Theme, Fish Hook Earring Set. 1 1/2" X 2 1/4". Burnished Copper Tone, Thin Patina Metal, Fish Hook, Tear drop Dangle Earring Set. 1 1/4" X 3 1/4". Gold Tone Clear Rhinestone Fish Hook American Flag Star Dangle Earring Set. 1" X 1 1/2". Rhodiumized Fish Hook Animal Flying Pigs With Wings Dangle Earring Set. Drop length 1 1/8". Silver Tone Blue Glitter Epoxy Fish Hook Starfish Dangle Earring Set. Drop length 1 3/8". Antique Gold Tone Fish Hook Dangle Leaf Earring Set. Drop length 2 1/8". Patina Metal Turquoise Stone Tear Drop Dangle Fish Hook Earring Set. 1 1/2" X 2 3/4". Patina Turquoise Stone Fish Hook Sea Life Starfish Dangle Earring Set. 1/2" X 1 1/4". Burnished Silver Tone, Turquoise Stone, Fish Hook Dangle Earrings. Drop length 2 3/8". Antique Silver Tone Christmas Snowflake Dangle Fish Hook Earring Set. Drop length 1 7/8". Antique Silver Tone Fish Hook Cat Dangle Earring Set. Drop length 1 1/2". Burnished Silver and Copper Metal Fish Hook Dangle Leaf Earring Set. Drop length 1 3/8". Burnished Silver Metal Fish Hook Dangle Leaf Earring Set. Drop length 1 3/8". Burnished Silver Tone, Multi Color Abalone Shell, Fish Hook, Butterfly Dangle Earring Set. 3/4" x 1 1/8". Drop Approximately 1". Fish Hook. Drop Approximately 2.3". Fish hook. Matte Gold Tone, Black Rhinestone, Fish Hook, Dragonfly Dangle Earring Set. 1 1/4" X 1". Burnished Gold Tone, Cream Fresh Water Pearl, Fish Hook Coral Reef Dangle Earring Set. 3/8" X 2". Green & Red Rhinestone Fish Hook Dangle Christmas Tree Earring Set. 5/8" X 1 1/2". Drop approximately 3.8". Lead/Nickel compliant. Fish hook. Antique Gold Tone Fish Hook Arrowhead Dangle Western Theme Earring Set. Drop length 3 1/8". Antique Silver Tone, Blue Glitter, Fish Hook Dangle Marcasite Look Earring Set. Drop length 1 7/8". Antique Silver Tone, Metal, Dangle Fish Hook Earring Set. 1 1/2". Antique Silver Tone Fish Hook Helm Dangle Earring Set. Earrings featuring a ship's wheel. 3/4" X 1 1/8". Antique Silver Tone Halloween Ghost Boo Dangle Fish Hook Earring Set. Drop length 1 1/2". Antique Silver Tone, Turquoise Stone, Metal, Fish Hook Dragonfly Dangle Earring Set. Drop length 1 5/8".